The DFL’s been trying to make a lot out of the last few polls released on the Minnesota Gubernatorial race. Most of them show Dayton leading Emmer by one margin or another – from the tight to the ludicrous. Ed and I were discussing the polls on our show over the weekend, and we noticed something. Strib/”Minnesota” Poll – D+4 (meaning they figure that Democrats will make up four percent more of the electorate than Republicans on election day. Now, this is a function of how these polls determine “likely voters”. This formula varies among polling services, but – since it’s a form of science, however imprecise – is hypothetically based on some kind of math, derived from experience. And what has “experience” been in Minnesota, especially recently? In the 2008 election, Minnesotans’ spread was D+4. In other words, Democrats made up 4% more of the electorate than Republicans did. The pollsters are honestly suggesting that Democrats are going to turn out in the same number as in the Democrat landslide of 2008? Or that Independents are going to break the same way they did two and four years ago? 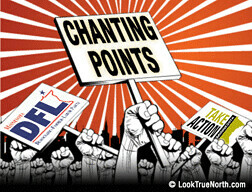 This entry was posted in Campaign '10, Chanting Points Memo and tagged MNGov 2010 by Mitch Berg. Bookmark the permalink. Wait a minute. Rasmussen Poll: D+5? That can’t be. Flash has repeatedly told us it’s the RamusRepublican poll. And he knows, cause he’s Mr. Centricity. the strib will be getting their message out to 7000+ fewer readers than last year – they are reporting a 2.32% decrease in their readership since 9.30.09. I got a mailer from the STrib today. It went straight into the recycling bag unopened. I’d be curious to know where you’re getting that D+4 number for the 2008 election.